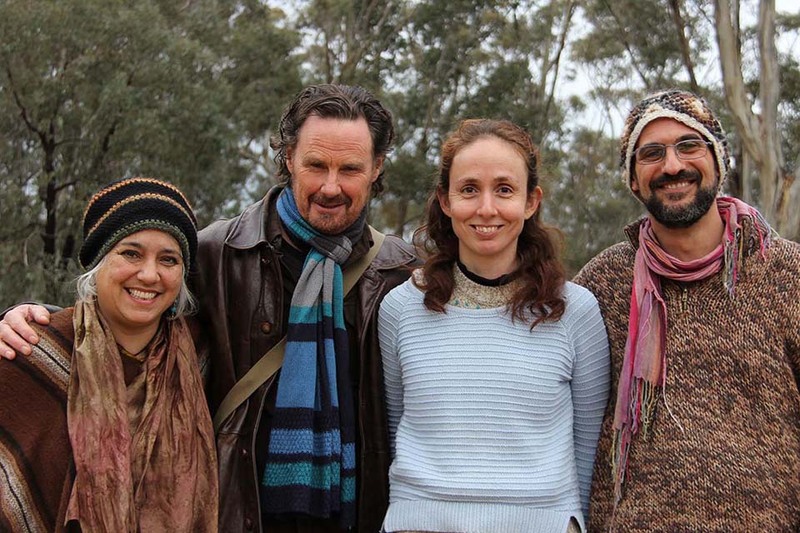 Four talented Victorian songwriters will get together with traditional land owners, naturalists and ecological experts in central Victoria to produce new songs that reconnect people to place – songs that community choirs and schools can learn and sing to celebrate and express the deep story of their country. Neil Murray, writer of the iconic ‘My Island Home’, ARIA award winning Kavisha Mazzella, the multi-talented Carl Pannuzzo, and indie artist and community musician Eva Popov are the lucky songwriters chosen to be part of this exciting project. Singing from Country will take place on traditional Dja Dja Wurrung Country; the goldfields of central Victoria covering the shires of Hepburn, Mount Alexander and Greater Bendigo. It is the first step in a project that is planned to eventually expand across the whole of Victoria. The songwriters will learn about the role of the Dja Dja Wurrung language in connecting to place, people and seasons. “Victoria’s Aboriginal Languages reflect a deep connection to the land, providing us wisdom about how to care for it,” says Paul Paton, of the Victorian Aboriginal Corporation for Languages. The songwriters will also learn from experts in local flora and fauna and land management. From these encounters, they will compose new songs that bring all of these components to life through song. In October a community gathering will provide the opportunity to share the wisdom of key knowledge holders and hearing from the community. All interested community members, both from within the region and outside, are welcome to attend. The gathering will include a showcase concert where the four songwriters will unveil their songs. Local choir-leaders will then arrange and rehearse the new songs with their singing groups, culminating in a performance of the songs by choirs in a celebratory event as part of Castlemaine State Festival in March 2017. Singing from Country is funded by the Regional Arts Fund and led by Community Music Victoria in partnership with the Victorian Aboriginal Corporation for Languages. Many Victorians are street-wise but not land-literate. Music can communicate love for land, deepen knowledge of country and strengthen community. Victoria was once a place where approximately 40 indigenous languages were spoken. These languages spoke richly of our land and the wisdom of how to care for it. This knowledge, now shared by environmentalists from all walks of life is needed now more than ever. 'Singing from Country' is an innovative project which aims to inspire songwriters, choirs and other community members to learn about, appreciate and celebrate Country. The project will gather songwriters, Aboriginal knowledge-holders, naturalists and ecologists through workshops sharing knowledge of Country – a creative, collaborative process leading to a celebratory concert. From the project will come songs that help reconnect people to place. Recordings will provide a resource for choirs and a video will document the project. Singing from Country will run in collaboration with VACL (The Victorian Aboriginal Corporation for Languages) and Connecting Country. The project is funded by the Australian Government's Regional Arts Fund through Regional Arts Victoria to run between May 2016 and March 2017 in regional areas, which broadly encompass Dja Dja Wurrung Country*. This will be a pilot for a statewide project. The Singing from Country Steering Group, representing all the project partners, have appointed a selection panel who will review all applications and select 4 songwriters to undertake the main aspect of this project. Are available to attend at least one Singing from Country Workshop to be held on Sept 11 and October 9 in the one of the above towns. A cover letter addressing the 5 criteria above. Your CV with evidence of songwriting, choir work, collaboration and performance. A link to recordings of 2 songs, which would demonstrate your suitability to be selected for this project. Aboriginal people are encouraged to apply. Songwriters will be paid $900 for attendance at least one Singing from Country Workshop and composing 2 songs. There will be an additional performance payment for the final concert. We welcome applications from people who can show a connection to a region which forms a large part of central Victoria -Dja Dja Wurrung Country…’from Creswick and Daylesford in the southeast to Castlemaine, Maldon and Bendigo in the east, Boort in the north, Donald in the northwest, to Navarre Hill and Mount Avoca marking the southwest boundary. Dja Dja Wurrung Clans Aboriginal Corporation (2014), Dhelkunya Dja, Dja Dja Wurrung Country Plan, 2014- 2034. The Singing from Country pilot project will be conducted in the southeast corner of this Country – the shires of Hepburn, Mount Alexander and Greater Bendigo. Maldon Folk Festival will launch the Singing from Country Project in the last weekend in October. This ‘festival-within-a-festival’ - features two connected events that will change the way you think, feel and express stories about our great land. On Saturday 29th October from 1-6pm a workshop will feature stunning presentations from local ecologists, songwriters and traditional land-owners. At 8pm, an all-star concert featuring ARIA winners, Neil Murray, writer of the iconic ‘My Island Home’, Kavisha Mazzella, the multi-talented Carl Pannuzzo and indie artist and community musician Eva Popov. Come to each as a separate event or attend both. Singing from Country aims to unite songwriters with traditional land owners, naturalists and ecological experts in central Victoria to produce new songs that reconnect people to place — songs that community choirs and schools can learn and sing to celebrate and express the deep story of their country. “Music is a universal language’ says the project’s originator, Terry White, “It tells stories. It helps communicate love for land, deepen knowledge of country and strengthen community. “Many Victorians are street-wise but not land-literate. When people sing together about country, it is a powerful force for uniting and galvanizing action. The workshop at Maldon will feature local ecologists, field naturalists and traditional land-owners who are engaged in indigenous language retrieval. Participants will learn how Dja Dja Wurrung people have seen this country for thousands of generations and how that knowledge can enrich their own understanding. “Victoria’s Aboriginal Languages reflect a deep connection to the land, providing us wisdom about how to care for it,” says Paul Paton, of the Victorian Aboriginal Corporation for Languages, a partner in this project. Interested songwriters are urged to attend, and not just songwriters - everyone will get something out of the workshops. The four Singing from Country songwriters will also contribute to the workshop – sharing their experiences of writing for this project. They will then unveil and perform these songs at the evening showcase concert, so concert-goers will have be observing the act of creation. Be prepared to join in, as these songs are being written for groups to sing. It is hoped, this launch of the project, and follow-up Singing from Country events in the local area will inspire a generation of grass-roots songwriters to reflect on their personal connection to land and write from that place. In March 2017, local choir-leaders will arrange and rehearse new Singing from Country songs with their singing groups, culminating in a performance of these songs by community choirs in a celebratory event in the Castlemaine State Festival. Singing from Country is funded by the Australian Government's Regional Arts Fund through Regional Arts Victoria and led by Community Music Victoria in partnership with the Victorian Aboriginal Corporation for Languages.